This classic is the definitive book written about Dr. W. Edwards Deming and his important work. 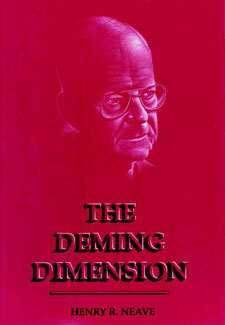 The author and Dr. Deming were friends and colleagues who worked together for many years. Dr. Neave has ably communicated both the principles developed by Dr. Deming and the philosophy behind those principles. It begins with a first-rate historical perspective, going on to clearly explain the basic tenets of the "Deming philosophy"—which shows both what needs to be done and what needs to be undone—and why. Dr. Deming's most up-to-date ideas on themes such as Joy in Work, Innovation (not just improvement), Cooperation…Win-Win, and Optimization of Systems are clarified. Also included was Deming's latest work on the System of Profound Knowledge, the system of thinking that provides the foundation for his work. I learned more in four days than in some entire academic courses!